Discussion in 'Non-Indian Domains' started by Prashant Sharan, Apr 6, 2019. Let's look at the market's performance on 5th April, 2019. The top sale of the day was T.win which sold for $22,500 at Sedo. NameBio recorded 322 sales $100+ for a total of $199,885 with an average sale price of $621. Compared to the previous day there was a decrease of 2% in the number of sales but the total dollar amount increased by 40%. We also recorded an additional 1,317 sales below $100 for a total of $33,585. The domain LawZoom.com sold for $938 at DropCatch for an increase of 730%. It last sold for $113 on February 23rd, 2019 at GoDaddy. 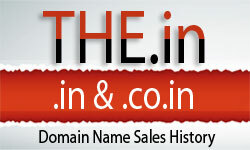 The domain Redig.com sold for $2,009 at NameJet for an increase of 414%. It last sold for $391 on February 22nd, 2006 at SnapNames. The domain RedefinePossible.com sold for $1,416 at BuyDomains for an increase of 245%. It last sold for $410 on May 11th, 2017 at NameJet / TLDPros.com. The domain Dovecot.com sold for $690 at GoDaddy for a decrease of 54%. It last sold for $1,500 on January 1st, 2012 at Afternic. The domain SmarterNetworks.com sold for $615 at DropCatch for a decrease of 79%. It last sold for $2,888 on May 12th, 2009 at Afternic.